Well I thought i'd better start with the build thread. Think its been 3 months since I got my chassis pack from Handy. 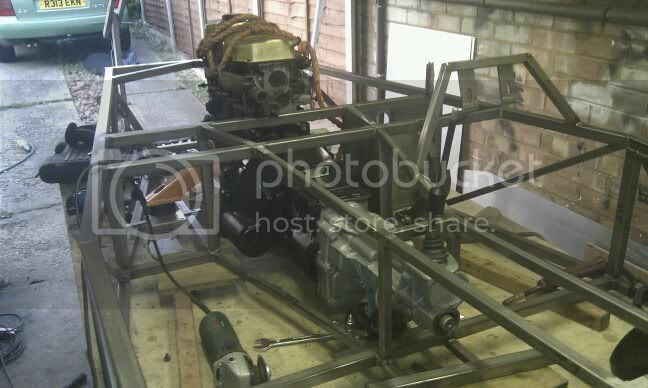 The chassis is nearlly there, need to finish fully welding and add suspension brackets. 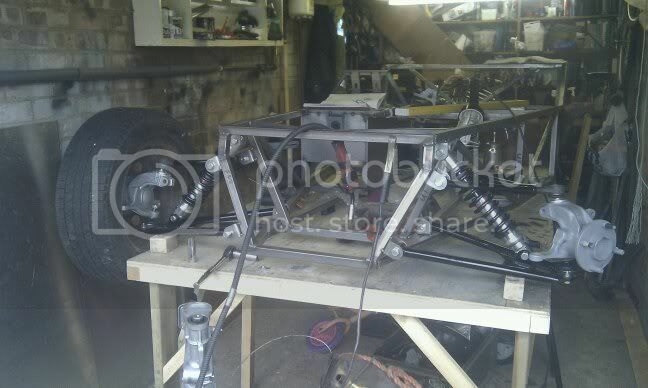 Looking good mate, getting the suspension brackets on is a massive milestone. 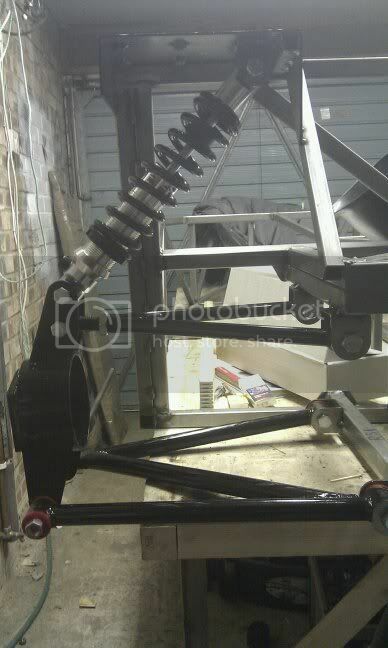 well not lots done but started tacking the rear suspesion mounts on, and there was a nice delivery of shiney shocks! Added the metal panels in the drivers footwell, started fully welding parts of the chassis. Welder decided to start cutting out a lot thought this was the cold or the fact the welders getting on a bit. End up the connections in the plug had come loose, I guess the plug gets thrown around a lot as I only have two sockets in the garage. Last edited by MikeB : 21st December 2010 at 07:09 PM. Hey Dude, your TVR has the same engine that I have installed into the Roadster, (with a degree of difficulty)! What engine are you planning to use? Finished my roadster after 5 years! Number 27! Small update on the build hopefully a bit more progress as I think I may have a couple of days in the garage coming up! 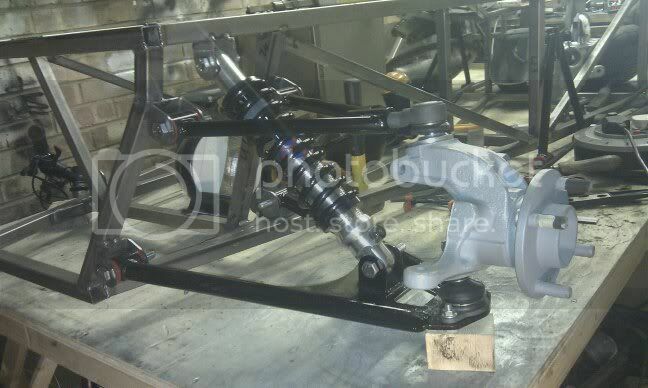 I've tacked on one side of the front suspension brackets and trial fitted everything. Thanks to Andy for getting my mushrooms modified (note anyone with 3ge mushies they will probably need modifying to get a full nyloc on the thread of the drag link). Theres also a bit of gap at the front edge (the back edge it touching) of the upper front wishbone mount where it sit against the front frame, from recollection this is to be expected. 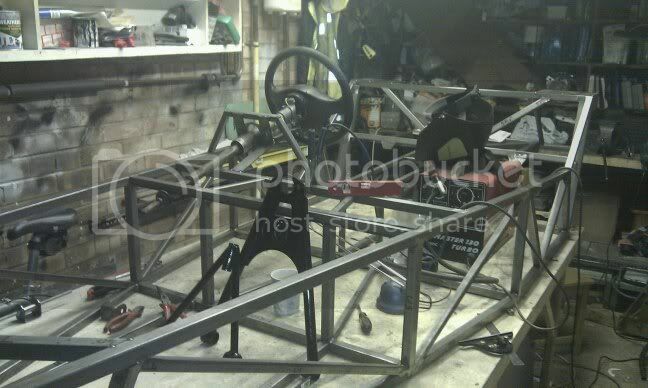 So with a bit of a push the chassis should be finished soon. Can't wait to get it painted and panelled so I can start to actually build the car. So after starting this build in September I'm nearlly back to where I was with my firts build, moral of the story if you sell up keep your chassis somewhere you don't get much for them anyhow! Last edited by MikeB : 27th April 2011 at 02:10 PM. Glad you're building again! 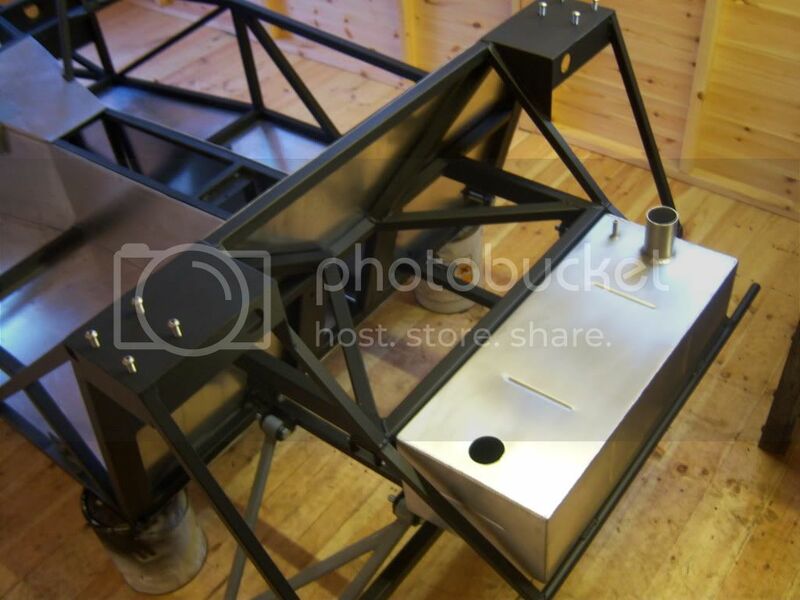 If you look in my photobucket photos below, you can see that I put all the bits from your last build to good use! Nearly finished now, so thanks! Actually, I need an exhaust for my Zetec install, so can you change your engine plans to Zetec. That way when you give up this time, I can get a bargain exhaust!! I think it's funny how we all tackle stuff in different orders. That's next on the cards..
Also mocked up the engine and box, gearbox mounts are in engine mounts nearlly there will finish that tomorrow. 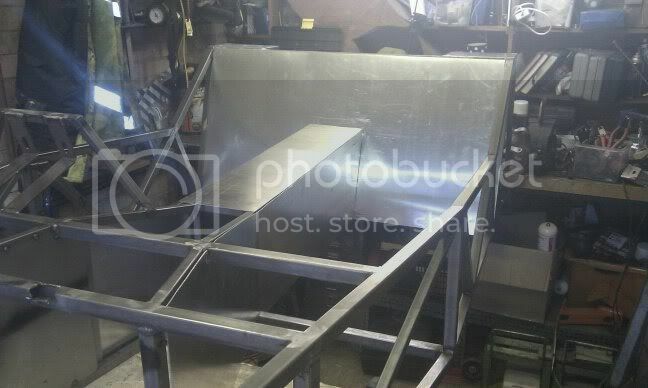 Its then finishing welding a few bits and bobs, cutting some ali panel and painting, not to far our of order twin! I use the actual suspension components and cut down jig to put the brackets on. Glad the builds going well Adrian, can't find a pre 95 zetec for love nor money so sticking with the boat anchor for IVA then swap back to zetec. Like the seats are they westie ones? Last edited by MikeB : 28th April 2011 at 11:35 PM. No idea if the engine runs, only just wired the megasquirt up, and still waiting for an exhaust, but if it's a duffer, I know where you live!!! Sure it'll be fine, it's unusual for them to wear out. Hope so, cos like you said, trying to find a pre 95 one is getting really hard! Got bored with welding so made some interior panels out of the ally I had knocking around the garage, it will be more difficult to cut once the build table has gone so a good job out of the way just need to order a new peice for the floor and bulkhead. I used a jig saw with a ali blade in it (I think wood blades work ok to) this seems to give a nice neat cut and a lot better than the angry grinder or aviation sheers. 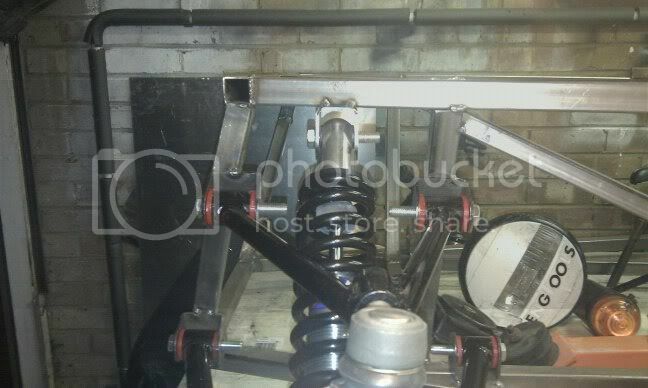 I found this picture of my old chassis just after I sold it, a lesson to all if you have to sell up keep your chassis somewhere for the amount of cash you get for it you might want to build again. The good news is I'm nearlly back to where I was! Last edited by MikeB : 6th May 2011 at 01:34 PM.